After graduating from Medical School in 1990 and having done her training in Beijing during five years, D. Wang Lan moved to Seattle for a year in order to get the Glaucoma fellow Speciality in the University of Washington. After gained enough experience in the eye surgery field, she went back to China and worked in the Orbit International Eye Hospital where she was part of the crew with other 24 eye specialists. They went to different countries to treat Eye deficiencies so Dr Wang Lan has enough International experience behind her. What is your Eye doctor speciality? My specialty is Glaucoma disease and Cataract. There are very different eye diseases but we can make a difference between 9 types. For how long have you been working in Aier Intech Eye Hospital? I just started here in September 2012 but the working environment is fantastic. 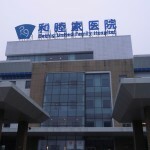 It is very difficult in China to be able to work in a good clinic with facilities for all patients. It is important to have a working team of doctors, nurses and customer service staffs that give you support and help you during the operations and here we have this advantage. How different is working in a private International clinic than in a public hospital in China? Actually, it is very complicated to have specialized services for all patients in China because of the fact that public hospitals are very full, crowded and people don’t have an appointment. Doctors and nurses are not able to care that long and it is mostly impossible to have a good relationship with your patient. The working environment in Chinese public hospitals is completely different than in Private hospitals. We can say that around 95% of the 3000-4000 patients are just walking into the hospitals and wait the entire day for consultation or even more. At Aier Intech, to make sure the quality of consultation every patient is supposed to make an appointment in advance, the communication between patient and doctor is highly valued. What type of patients do you have at the Aier Intech Eye Hospital? It is truth that we have Chinese patients because part of the clinic is linked with Chinese public health but we also have the VIP Clinic for foreign patients and people who have a private health insurance. The clinic environment is comfortable, our nurses are from China but most of them speak fluent English and the entire team has international experience so our services and facilities are the same than in U.S. or in countries around Europe. What medical issues can happen during an Eye defeat operation? Eye surgery is usually under risk and recovering is quiet quick. Most of the eye surgeries are done with local anaesthesia but if the case is serious or we operate children we do use general anaesthesia. For Claucoma and Cataract surgery we use local anaesthesia most of the times. When would you really recommend Eye laser? There are tow kinds of laser treatment: one is to correct refractive errors named LASIK; the other is to treat ocular fundus defect. People over 18 who have had a stable prescription for at least 12 months can have a consultation with optometrists to determine the suitability for LASIK; for the patient who suffers from Age-related Macular degeneration or Diabetic Retinopathy we usually recommend laser treatment. It is very easy and it takes no more than one day to recover but referring to LASIK, it is also truth that people with common vision defeats wearing glasses don’t get back a perfect vision. Sometimes depending on the problem it is better to wear glasses than undergo laser surgery with too high expectations.